A Summer at Oak Crest is more than just a Summer Job, it is an opportunity to reach your full potential while helping others reach theirs. Every year, we hire high school seniors, college students, graduates, and adults to fill our Group Counselors and Specialist positions. We look for applicants with personality, character, stability, integrity, and warmth. Most importantly, we look for staff with a sincere desire to help our campers achieve personal growth and success over the Summer. Working at Camp is both an incredibly rewarding and challenging experience. Think you have what it takes to join our Staff? Review the Summer Openings listed below and complete our online application. Camp 2019 Dates: June 27, 2019 – August 23, 2019 (Monday-Friday, 8:30am-4:15pm) No Camp July 4th & 5th. ** If you are applying for a job at Oak Crest it is assumed that you will be able to commit to the full 40 days of the contract (dates listed above). Come to Oak Crest and be part of an elite swim instructor and guarding staff. WE CAN CERTIFY YOU IN LIFEGUARDING AND CPR, AND WE WILL FULLY REIMBURSE YOU FOR WSI Training!!! Working at camp is much more fun than just sitting by a town pool all summer AND you can make extra $$ after camp teaching private lessons! One of the best jobs you will ever have in your life. Come to camp and make a difference! 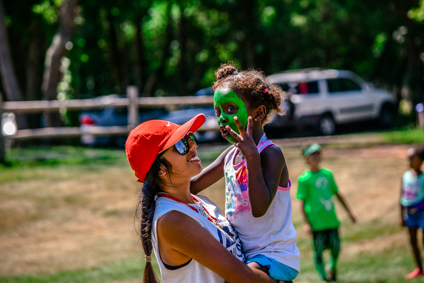 Counselors spend all day with one group of kids, participating in a wide variety of activities and caring for the campers’ basic needs. Oak Crest Day Camp offers LOTS OF FUN for staff, including staff parties and outings. If you are a high school senior, or college student, and want to work with children ages 3-15, give us a call to find out more. Counselors must have finished sophomore year in college. Travel on local day trips 2 to 3 times a week, as well as one overnight trip to Club Getaway in Connecticut or Williamsburg, VA. Supervise 13 and 14 year old campers. THE MOST POPULAR JOB IN CAMP! A great job for Board of Ed Drivers, professional drivers or moms with kids! HIGHLY COMPETITIVE SALARIES. Earn up to $18.00 per hour! Must have CDL with Endorsements S and P.
Be a part of a very important childhood milestone. Teach basic bicycle riding skills to our campers ages 6-14 on Oak Crest’s brand new Bicycle Village. Our Bicycle Village is complete with a 1/4 mile training course, a state of the art pump track, and a mountain bike preparation trail. We are looking for a knowledgeable bicycle enthusiast that loves working with young riders and can keep our campers safe on the course. Teach basic skateboarding skills to our campers ages 8-14 in our Skatepark (complete with a 4′ Halfpipe). We are looking for a knowledgeable Skateboarding enthusiast that loves working with young riders and can keep our campers safe. Teach basic cooking classes for ages 3 through 10. Looking for that special creative person who has great food ideas that will make cooking fun and exciting for the kids. Come and be part of the Elite Oak Crest Climbing Team. Teach climbing and belaying on our state-of-the-art ropes course which includes our new 40′ climbing tower. We will certify you to use the climbing equipment! As a specialist, you will remain in one area, while different groups of campers visit your activity. You will have a chance to work with many different campers and staff members. If you have a passion for a specific craft, sport or other activity, this may be the position for you. Specialists help design the activities for the program, put together supply lists for items that need to be ordered, create lesson plans with objectives and goals, and help guide the campers to meet their goals and expectations by providing direct, hands-on instruction in their respective areas. If you have completed your freshman or sophomore year in HS and are looking for a great summer experience, being an Oak Crest Leader-in-Training may be for you! This is a tough but rewarding job with lots of real responsibility. We are seeking highly motivated 15 year olds who have a genuine love for working with children. Note: LIT must pay full tuition to participate.